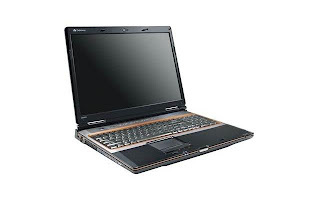 The Gateway comes up with a new P Series FX Edition ‘P-7808U FX’ with 17 inch monitor and Intel Core 2 Quad processor. This is a good product for playing computer games and those who are crazy about computers. It is a quite luxury product, but it is a good value product for gaming. The Gateway P-7808U FX Notebook contains a glossy black shell with Halloween- esque orange, carbon fiber options and silver. It provides a very comfortable keyboard with a copper border and exhibits a little flex. The mouse buttons are snappy and easy to press faster. The hard drive type is SATA with 4 GB of RAM and hard drive space is 500 GB with a speed of 5,400 rpm. It has a DVD optical drive with a optical drive speed of 8x. The display size is 17 inches with a native resolution of 1440 x 900. The graphic device is Nvidia GeForce 9800M GTS with a video memory of 1 GB. Other features of P-7808U include Wi-Fi technology of 802.11a/b/draft-N with Bluetooth facility (Bluetooth 2.0+EDR). The ports include eSATA, VGA, Modem, Microphone, Kensington Lock, HDMI, Firewire, and Ethernet with 3 USB ports. The card slot contains an ExpressCard and the operating system used is Windows Vista Home. The dimension for P-7808U is 15.8 x 11.8 x 1.7 inches and the weight of this product is 9.0 pounds. The warranty period and support is provided for one year and the price of this device in the market is $1,699.99. Even though this Gateway laptop PC is little expensive, it is perfectly suited for PC gaming and entertainment. You can also read latest laptop reviews on popular models, check out laptop special offers, deals and free laptop deals at laptopreviews.org.uk.